Years ago, some days before Lisa landed in a broken heap on my sleeping bag at the base of a wall deep in the Hex River valley after multiple cliff-strikes during a B.A.S.E jump, she had showed me footage of a skydiver impacting the tarmac whilst still fighting to rid his canopy of riser-twist. As a professional camera-man on assignment the footage was P.O.V shot old-school on a VHS camcorder, long before the GoPro craze. My memory adds film grain to match the stark living quarters of a dirtbag skydivers lounge floor. Eating cheap Chinese, sitting on cushions on the floor of her apartment I remember being taken aback at the whole scenario but, mostly, his calm, silent, focus on fixing the situation  right up to point of impact. seconds later feet run into the frame and its clear he is being attended to. Miraculously he lived to jump again. fly B.A.S.E canopy to the landing. What could go wrong? Mike Muldoon phoned late in the afternoon of my last day in the valley to say hed finished paragliding for the day and I should bring my wing  quite understandable that he didnt want to have to fetch his wing out of a tree or risk it getting wrapped around a buss as it made its own way earthward, after being unceremoniously ditched in the cut-away. The fact that the largest wing that I had with me was my Ozone XxLite 16, a single-skin lightweight (it weighs 1.2kg) mountain wing was a little concerning (to me). Michael, Richard (a local instructor) and I met at the bottom ski lift of Brevent at 16:00. Last lift was at 16:30. 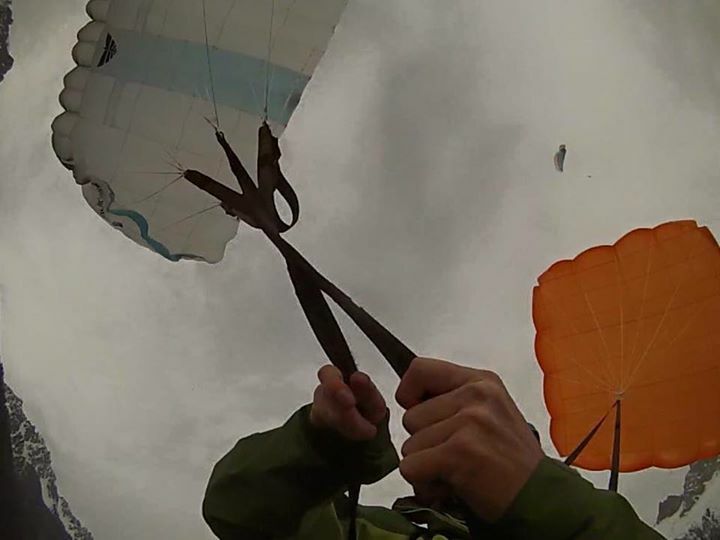 A time-pressured explanation of how to connect the B.A.S.E-harness correctly (I learned that if I forgot to connect the deploy-cord then Id cut away a perfectly good wing, watch it float off as I plummet  without the B.A.S.E canopy deploying) ensued. Ill admit to the solitude of the cabin-ride gave a pretty serious feeling to the whole thing, I figured that there was a less than even chance of the XxLite deploying the B.A.S.E canopy, a 1 in 5 chance I couldnt reach the toggle and a less than even chance of then being able to throw the reserve. Not great odds, but hey  its like asking the prettiest girl in the bar for her number, sometimes the risk is worth the reward. Laying out on the SW take-off, a gentle wind came over-the-back, forcing a move to the SE take-off. Felix Rodrigues was on launch, and he was super excited (and animated) that I was going to pull the red handle  nothing like celebrity pressure to get underway. I gave my best impersonation of a nonchalant French shrug, and asked him to just watch my wing as I ran it off in zero wind. Like most things done for the first time, things happened rather fast  accentuated by the brains inability to predict the sequence of events so it all seeming to happen simultaneously. There was the stomach-churning falling sensation as my main wing and I parted company, followed by the rush of air and then a jerk, followed by a secondary bump. My first image is looking up at the blue of the B.A.S.E canopy, so bringing my hands up in search of the toggles focused my vision on the risers  complete with riser-twist! Id seen this film before. inbound. Contrary to the initial new-thing-time-scale, add some real and immediate threat and like most things done under pressure with consequence, time seemed to stand still. The irony of the paradox was lost on me while I was fighting with the riser-twist for what seemed like a LONG time. Eventually I was concerned that I MUST be close to impact  yet I became curiously aware that there was no sense of ground-rush, no rush of air, no sense of impending doom. At the same time I was beginning to question why my B.A.S.E canopy appeared to be at an angle to the vertical rather than directly overhead  almost as if it were in front of me. Beginning a process of elimination started with a glance over my right shoulder, which revealed a very real, and perfectly deployed reserve canopy. Total time between cut-away and this point was 3 seconds. tree? At some point I realized that I could use the B.A.S.E canopy as a steering spinnaker, and guided my way back toward the LZ, touching down gracefully and not even requiring a roll, on the far corner of the LZ. It is often said that; one must be careful what one wishes for, you might get it. There was an awful lot of neuro-input in a very short space of time  exactly what I was looking for, although not quite in the exact manner anticipated! Its a, seemingly, contradictory way to appreciate life  by risking it  but it is the purest, most honest medium that I know. To see things without the clutter, and noise, of life, sometimes it is necessary to force the detox. Risk is a funny thing. It is ever-present, it is run from and it is sought. The challenge is to match the variables (controllable and otherwise) to the level of acceptable risk, for the individual. It is a right, but it is the individuals responsibility to understand, as best as possible, the possible permutations and associated possible consequences. For whatever (personal) reasons, I judged the reward worth the risk of a number of unknowns  I was not sure the main wing would deploy the B.A.S.E canopy, I was unsure that, even if the B.A.S.E canopy deployed, that I would be able to reach the right hand toggle, and I was reasonably certain that I wouldnt be able to throw the secondary reserve if needed. and to remind myself of my ability to deal with serious situations, to have the mind cleared of cobwebs and self-doubt. To remind myself what it is to live.